We’d like to introduce two wonderful people to you. Adina Curca and Deborah Lawson are the latest volunteers to join team Krizevac. They’re offering 6 months of their time to share their skills and knowledge of early years development to the Care Givers at Mother Teresa Children’s Centre in Chilomoni Township, Malawi. Debbie packs her “Survival Kit”, we’re hoping she’s also packing that beautiful Christmas jumper! 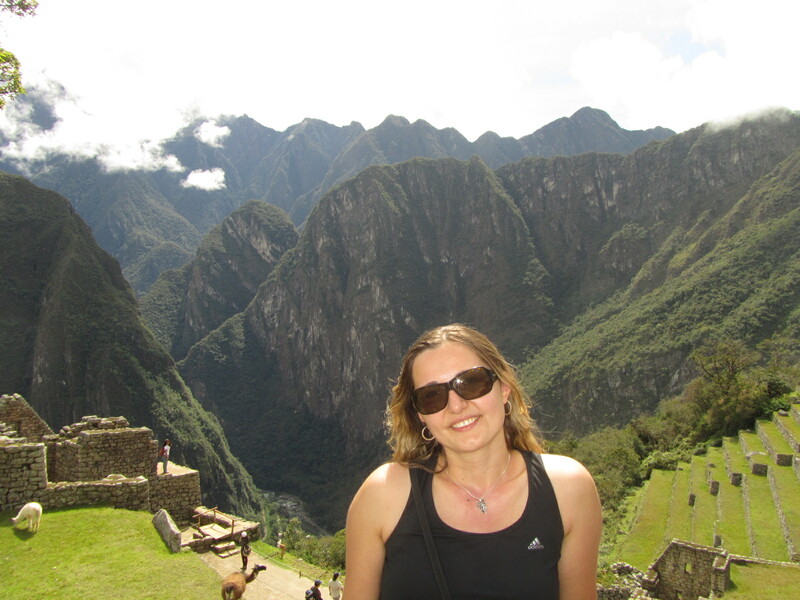 Debbie is a qualified teacher, but for the past few years has followed her passion for working with younger children by working in UK children’s centres. Debbie impressed us with her understanding of children’s needs and enthusiasm for supporting the newly trained Malawian team, so they feel valued and proud of their achievements in Chilomoni. Both volunteers are packed and ready to catch their flights as soon as they’ve celebrated the New Year with family and friends here in the UK. They’ll be living at Mitsidi volunteers’ village and joining our current team of engineers and teachers. 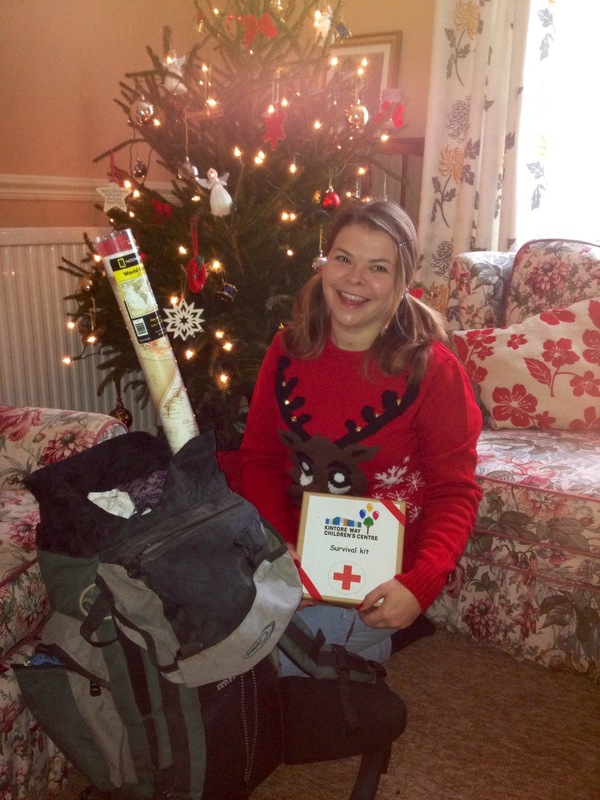 Thank you from Krizevac to all our amazing volunteers in Malawi, you’re an inspiration to us all! Happy Christmas from JCB to children in Chilomoni! 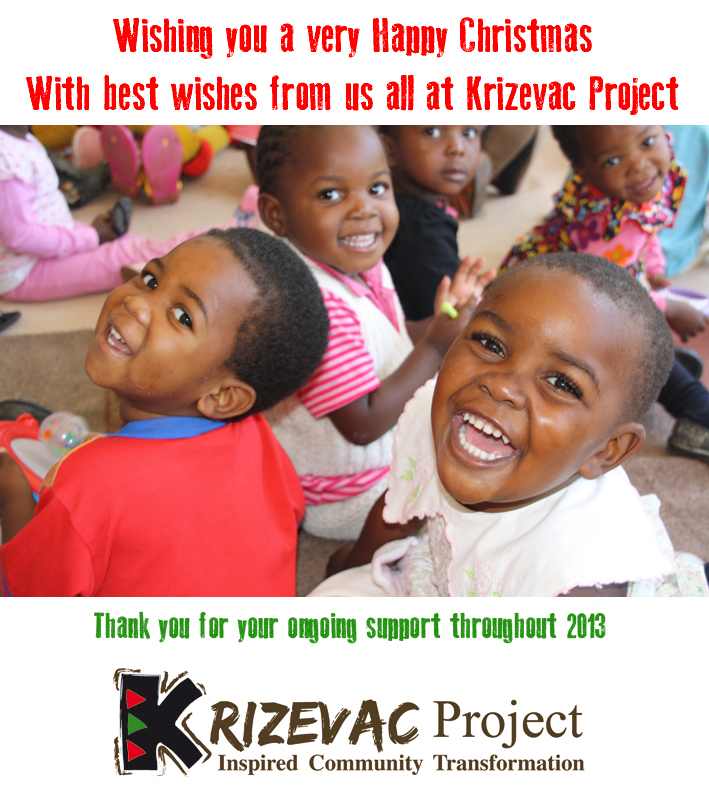 Many thanks from all at Krizevac Project to the team at JCB World Headquarters, Rocester, for their kindness towards children at Mother Teresa Children’s Centre. Suvi Toropainen, Marketing and Communications Manager for JCB Africa and Middle East contacted Krizevac to say they would like to donate some special JCB toys as a Christmas gift to the children we help to care for in Malawi. Zoe Kasiya, Krizevac Resources Manager visited JCB yesterday to find a beautifully wrapped parcel, addressed to the children in Chilomoni under the huge Christmas tree at JCB. 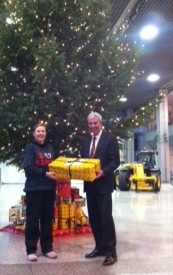 The gift was presented by David Bell, Chief Corporate Development Officer on behalf of the whole JCB team. Santa will have to get his skates on or have an extra sprinkling of fairy dust to help the parcel make the 5000 mile journey to Malawi in time for the big day! But we’ll be doing our best to make sure all the children enjoy a very happy Christmas in the “Warm Heart Of Africa”. Thank you JCB, for all your help and support throughout 2013. Many charities spend a lot of time, effort and money on complex planning, evaluation and make an academic study of development. We’re trying to spend our time, effort and money on action which transforms the lives of the disadvantaged. 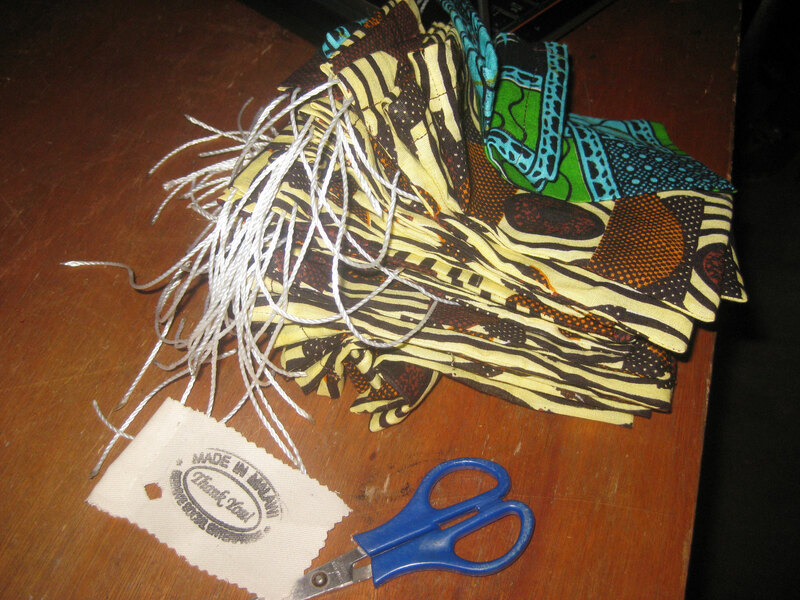 On a recent visit to Malawi, I was tasked with ordering 3000 little cloth bags from the Beehive Tailors in ChilomoniTownship. The order was from Mobal who wanted to gift the bags to their customers as a thank you. Since 2007 Krizevac Project has collected over 2000 sewing machines which were collecting dust in attics throughout the UK. 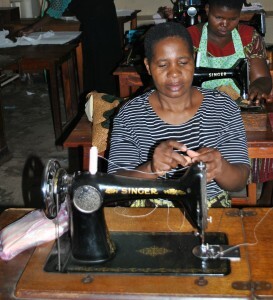 Every machine has been sent to Beehive tailoring school where experienced trainers help locals from Chilomoni to qualify on a two year tailoring and design course. Once qualified, women are able to take their machine to start their own businesses. 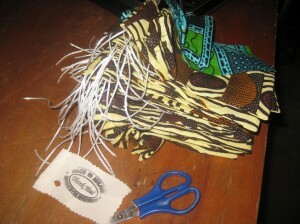 It wasn’t the first order for the traditional Malawian cloth bags. Vince Owen our Managing Director organised the first batch of bags in July 2013 and back then, he videoed the tailors so Mobal customers could see their bag being made (see this link). I was determined, on my follow up visit, to show the video online to the women who were featured. Bearing in mind many of them have never even seen a photo of themselves, let alone a video which is on the internet for the whole world to see, I was excited to see their reactions. They didn’t let me down! On a hot sunny afternoon, I took my laptop and a mi-fi dongle loaded up with data credit to the tailoring workshops and staged a showing of the Chilomoni Tailors. Initially they were all a little quiet, then after a few seconds the giggling began, by the end of the video they were whooping, laughing and teasing each other about their “performance” in the film. It was great to see their delight and I couldn’t help taking a photo of them watching themselves… next time I go back, maybe I’ll take a photo of the tailors looking at this blog about them looking at themselves…. you get the gist! The order for the 3000 bags was completed and each woman was paid for her share. This is vital income which will really benefit their families. Times are hard in Malawi right now, with rising costs and few jobs. By enabling businesses like Mobal to trade with Beehive, we know we’re really reaching the poorest of the poor. But it’s not “charity” in its traditional sense; it’s a fair transaction between a supplier and a customer. No wonder the tailors were happy, getting paid for a job well done, its all anyone wants isn’t it?